you may know me as @kneok, husband but mostly as the guy that takes Sabrina's pictures. I have a blog I try to update that's pretty dead, but she has been pestering me to guest write on here since ages on any topic at all. So far, I have resisted. But today, I'm guest writing for her blog and it has to do with what I'll be wearing for Raya. 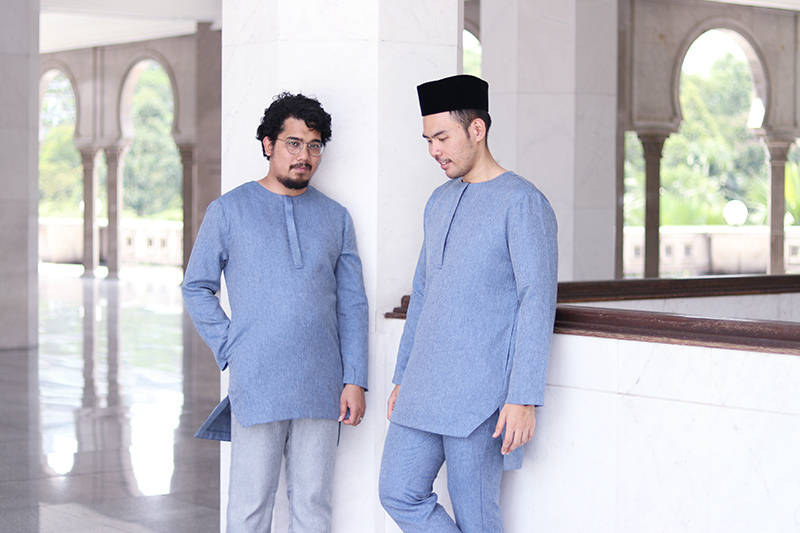 Earlier in the year, Sabrina excitedly told me about her plans with Ibnu Aswan to do a men's line for this year's Raya. Ibnu looks like a guy with a sharp fashion sense, so I sort of knew that the men's collection would be in good hands. In all honesty, as part of the process, I was also consulted - about the fabric and whether I'd wear this, or what can be done to improve that. So I did give some input for whatever it's worth. But when I saw the end result, it was pretty great. I think Sabrina and Ibnu can pat themselves on the back for a good job well done. The aereMEN's collection consists of the KALED Top and the ARYAN Pants. The material used is quite nice. 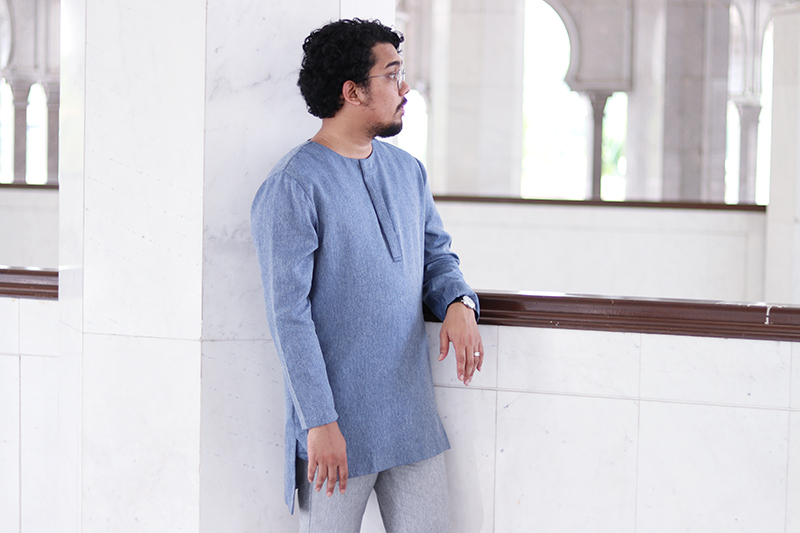 It has a certain heft - it is not too flimsy and doesn't feel like that RM 80 baju melayu that will rip apart on your 5th takbir. The broken twill weave, a.k.a the herringbone pattern is a nice added touch. Despite the weight, I find the material quite porous - meaning that it is breathable and should be suitable for our weather. The KALED Top's fit is very clean and relaxed. The design is simple, classic and with no frills. No one would accuse you of being a hipster/abang sado when wearing this. 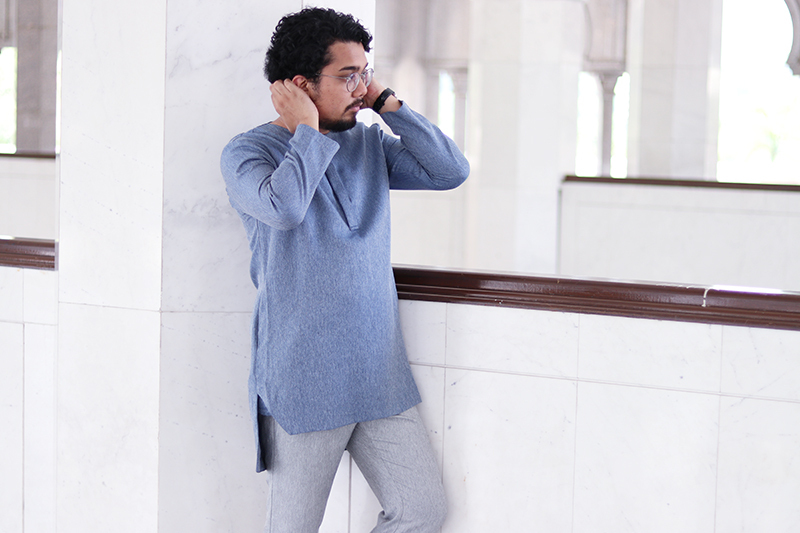 It can pass off as a kurta as well with its slightly longer back. They kept it collarless with buttons that are hidden. I also quite love the hidden pockets on the side. For keeping stuffs but mainly for.. looking cool in the photos. If you're a fan of aere (and I certainly am a fan of my wife's work), you'd know that one of the things that aere is really big on is versatility. So of course, when she asked for my input, I said I thought that was what is needed even for the men's collection. You simply don't want an elastic waist trousers that is only good if you can cover it with your baju melayu AND your kain samping. So the trousers are done in a way that can be worn casually and even for work. I think the trousers are really ace, the highlight being the double slanted right pockets - idea courtesy of yours truly. And what I said about elastic waistbands - there's none of that here and there are no belt loops too. Instead, there are side button tab adjusters. The cut is slightly slim fit but it hangs quite cleanly. The material is slightly lighter and very breathable. Sitting comfort is not compromised. I've actually worn the pants once or twice for work already and to go to Court - where dress codes are pretty important and quite stringent. I've had friends who have asked me where I got the pants from, and other people who have already bought the pants telling me they'll wear it for work too. So if you're thinking of buying something for your husband or brother or father for Raya, the set would be a very good gift. Or if you're a guy reading this, it's time to retire your elastic band raya pants for raya and get this instead. Actually, the only reason why I offered to write about this (she's pretty much given up on me guest writing on here before I brought it up) is because I found it really touching and how it's pretty sweet that she did this so we could wear something together. 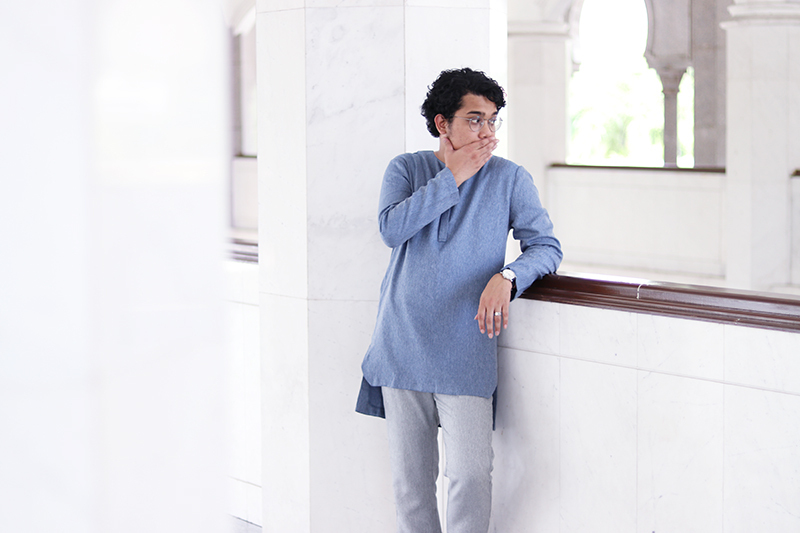 As with most guys, I don't really buy new baju melayu clothes specifically just for raya. I just use whatever I already have. But the aereMEN's collection are done in colours which will complement what the ladies will be wearing. I know first hand all the hard work it takes to pull of something like this and for that, I can fully appreciate all the effort to come up with something like this. To me, it's one of the really cool things about what she's doing right now. If she likes or wants something to wear, she can just get it made. As a lawyer, I can't quite reciprocate in a similar fashion. I can probably draft her an agreement or maybe file a suit for her in court, but... I think I'll stick to taking her pictures! (Or continue writing on her blog as a guest writer). She's read this and is already pestering me to write a blog post about photographs. How a guy like me, who doesn't like taking pictures (or have his picture taken) could have turned out to take acceptable photos. Hm... I don't know. Maybe. Sabrina's outfit from her post "FEELING IN MY SOUL"
Essay about yourself is not that easy. Your real intentions and career goals that are real. Achievements in the field should be humble but strong, have a glance for more info.